Notes: Oh geeze. Far from complete doesn't quite cover it, but I thought I'd get the page up and ready with what I have. There are going to be a lot of filler-images in this set, don't be alarmed, it's just that this is probably, asides from 1999, one of the hardest promotional years to complete. 1996 is a whopping two promo cards, so according to the official lists they're cards number 1 and 2 here. 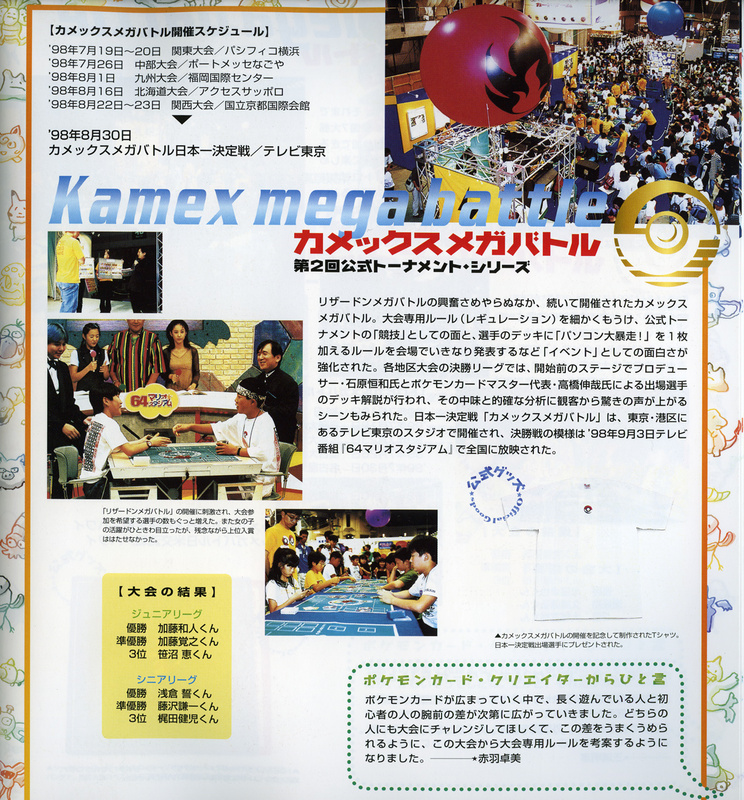 Included in this run are the World Hobby Fair Extended Sheet cards, the Mew and Mewtwo of which having been re-released with the Pokemon Anime Best Collection CD, a Toyota Campaign, and multiple CoroCoro/JR campaigns. 1996~1997 is one of those promo years which I also break my rule of following the official card ordering issued by Creatures (PCL) that used to be on Pokemon-Card.com. Originally, they list the infamous No.1, 2, and 3 trainers from both the 2nd Official Tournament and the Lizardon Mega Battle as both being from this year, but there is a problem with this: it doesn't make sense, especially in that order. 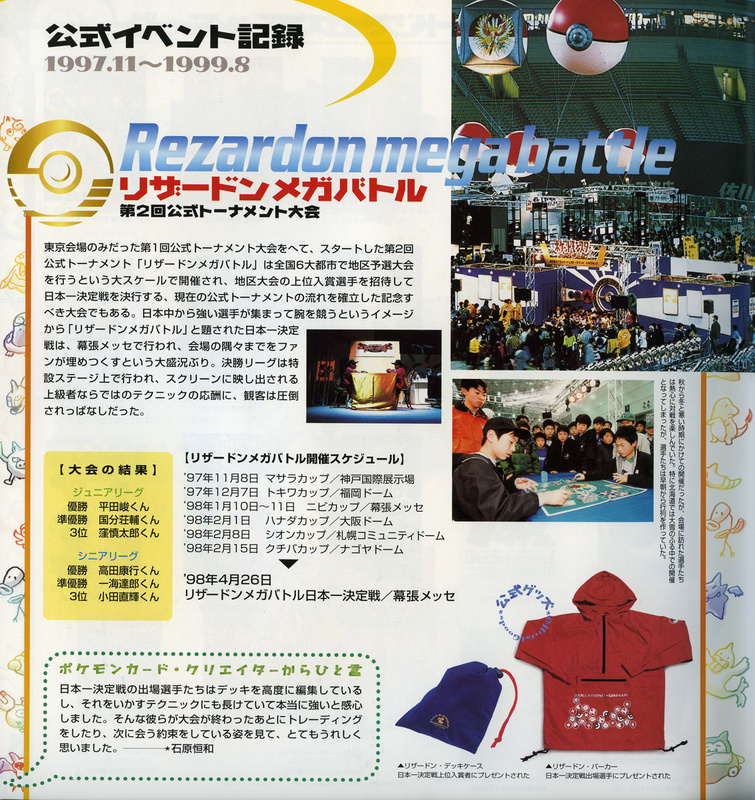 Both the Lizardon, and Kamex Mega Battle Tournaments were recognised as the '2nd Official Tournament' going by old pamphlets, and what books I have containing reports from the battles. 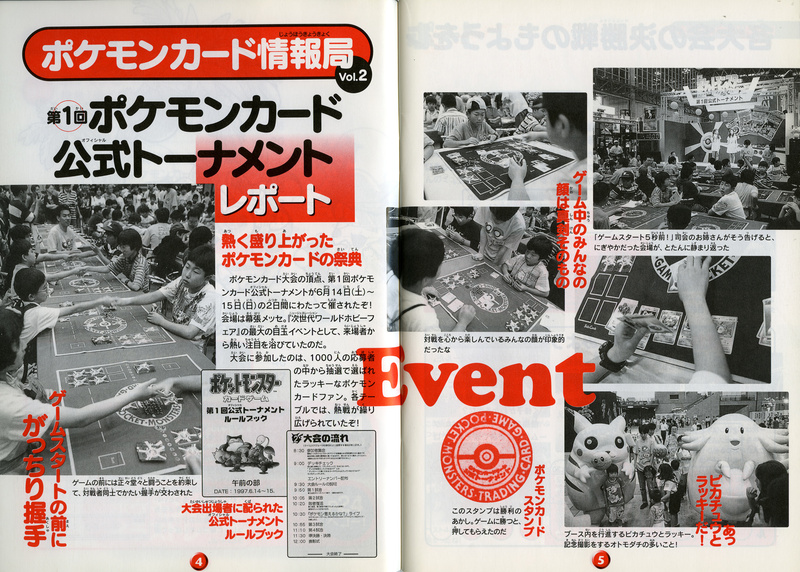 We know that an earlier tournament held in June of 1997 occurred, and it's more than likely that this is where the 'Lizardon' catalogued cards were actually issued as those who competed in the battle 'gained preferential/priority entry' to the 'Pokemon Card Game Official Tournament' by way of presenting that card. It's likely that with this wording, the card was actually issued then so that the winners could then enter Lizardon Mega Battle by way of a glorified invite. Using this logic, the '2nd Official Tournament' catalogued versions, known as the "1998" set to fans, are the true 'Lizardon' catalogued cards. Given the Lizardon Mega Battles ran from November of 1997 through to April 1998, this is very much a logical conclusion. All of that above, in addition to moving the 1998 issued Kamex Mega Battle (July/August 1998) trophy cards into the 1999 listing, is the only time I really agree with the fandom's way of ordering. Otherwise, I like it official! • Contrary to popular belief, the reissued promos from the Pokemon Anime Best Collection CD do not all feature Pikachu Records logo on them. The only cards out of all of these to feature any difference were the Charizard, Venusaur, and Blastoise reprints from the 1999 Intro Pack in the 1999 promos, and Computer Error which has a red shadow behind the Rocket Gang set logo, while the original issue from this year had a white shadow and was non glossy. • The No. 1, 2, and 3 Trainers from this year are some of the most well known Japanese trophy cards in existence asides from the Illustrator. During the craze of the 90's when Pokemon started taking over in the US it was rumoured that some of them sold for upwards of $10,000 due to elusiveness and rarity.